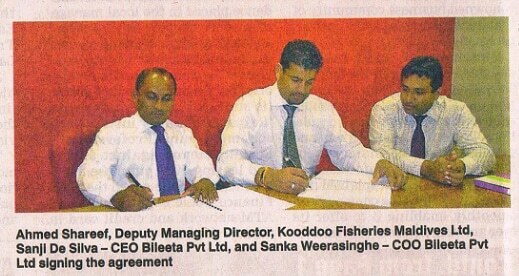 Hard on the heels of numerous local successes, Bileeta Pvt Ltd secured a prominent regional account, the implementation of an ERP solution for Kooddoo Fisheries Maldives Ltd. (KFML), a new’, Incorporated company with the main operation base M the former Kooddoo Fisheries Complex. This company has become the main play-er in the skipjack tuna operations of the country. “This is a huge business win for us as well a great achievement for a Sri Lankan company,” said Sanji de Silva, CEO of Bileeta. “We bid for this international tender and was selected from amongst many regional players thereby proving our capabilities of turning out world class ERP solutions for clients of medium to enterprise scale”. He added, that Bileeta was selected because of the unparalleled features of the solution on offer including solid data security systems, decision support systems and the team of application consultants who impressed the Kooddoos decision makers with their knowledge and efficiency. “Because this ERP solution is designed and developed by us, we could also offer Kooddoos with custom features to closely meet their requirements to overcome the pain points that they were currently facing,” said Sanka Weerasinghe, COO of Bileeta. The Kooddoo processing center has a land based freezing capacity of 450 MT/day with 2000 MT storage capacity together with a fleet of mother and collector vessels. Furthermore, an alongside berth can accommodate a large number of vessels making KFML the top firm in collection and processing of Skipjack tune countrywide. The company is also engaged in the operation and management of ice plants located across the Maldives Islands along with a water bottling operation based in the processing center. “We selected Bileeta because of their capability of customizing an ERP solution that fits our requirement,” asserted (Ismail Fuazy, Manager Accounts). “We have experience with 3 leading ERP within our group. We were impressed with the comprehensive set of features in Bileeta ERP which was built with latest technologies,” said Ahmed Shareef, Deputy Managing Director of Kooddoo Fisheries Maldives Ltd.
Bileeta specializes in developing ERP solutions for medium to large organizations. Its flagship product, Bileta ERP v6.0, is capable of delivering a wide range of functionalities to meet the localized requirements of companies at a significant cost advantage to traditional vendors. The company maintains this advantage through flexible licensing models, knowledge of local business processes and lower cost of support. It the short span of two and a half years of launching the product Bileeta has gained recognition by winning the National Best Quality Software Awards in 2011 in the e-Logistics and supply chain category, and was also selected by ICTA to showcase Bileeta ERP at the Cebit exhibition held in Sydney, Australia.